Editor’s note: This is the second installment of a two-part story. In part one, Rabia’s older brother and two sisters persuaded their father to buy a video cassette player so they could watch television despite the Taliban’s strict rules against it. The electronics were kept hidden in a bedroom closet. A group of Taliban called Amre Bell M’Roof, which means Taliban police, used to walk around at night just to know if everyone was sleeping, no lights were on after 10, and that no one was watching TV. They rode around in open-back Toyotas. One would be driving with the rest like ghosts standing in the back, gazing into the houses. Even now, whenever I see an open-back Toyota, it reminds me of them. My brother said, “Leave that to me,” and that he would need someone to help him lift up the TV. My other sister raised her hand, and so the two thieves tip-toed into the room. We waited by the door, watching. They lifted the TV without making any noise and quietly walked out of the room. We all cheered up then, and gave them a hand to carry it to the other room. Everyone started moving, one covering the windows with a dark, thick blanket that we had reserved for the days when we watch TV, others plugging it in and setting up the video player. We placed the TV on the ground and we put a big blanket on top of it. For an extra precaution everyone stuck their heads inside the blanket. There were three heads inside and the legs swinging outside, me and my sisters. We turned on the TV. It was such an amazing moment! I was so happy I couldn’t close my mouth. I felt like kissing the TV. It was an indescribable feeling with the light of the TV right in my face. I can never forget the white and black dots on the screen when Merwais first switched it on. It was so new and adventurous. This was my first movie. I thought I was inside the TV. The movie started and the first thing that appeared was the name of the movie, Dil Wale Dulhania Le Jayengay, starring Shahrukh Khan and Kajol. Then the rest of the names came on. I didn’t know a word of Hindi, so I just watched, people walking here and there, crying and smiling, the houses and the background and the dancing. I noticed every single thing. I didn’t care about the story or what was going to happen at the end. I was looking for other things, like the women wearing fancy things, the traditional Indian clothing, their lifestyle, the scenery, the water and jungle greenery. Everything. I was in my own world. It was hard to breathe under the blanket, that small space with three people inhaling and exhaling, so every other minute one of us would take our head out to get some oxygen. We were so lost in the movie that it was about 12 am when suddenly the door bell rang. Oops! Our hearts started pounding so fast, our eyes were sticking out, and our jaws dropped. The three of us were thinking the same thing: Taliban, we are dead and what is going to happen now. “I don’t know, but I know they have found out about this,” he said. We were terrified. My dad ran to the door. He also was overwhelmed with his own questions. 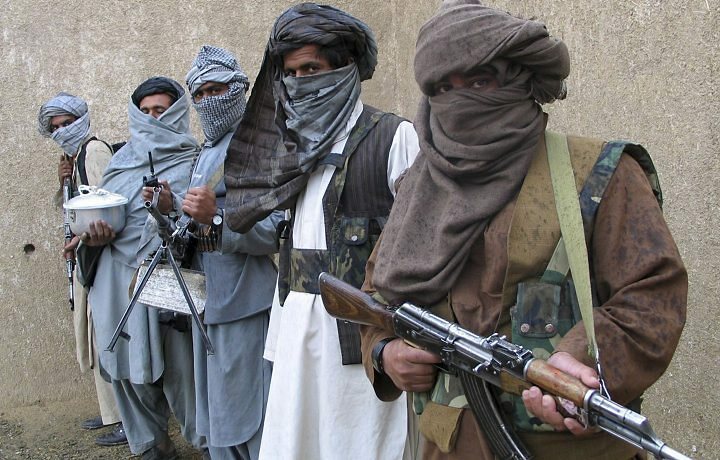 Who could it be at this time of the night…no one is allowed to walk around after the curfew … except for Taliban. He opened the door. It was them. God! We were all busted. I thought there was no chance. We are dead. We are gone. I went to the door and stood behind my dad, looking at them with one eye, scared and blushing, when one big, fat, football type Talib came forward. He had on a black turban and black clothes, his fat belly hanging out, and a long, dark, black beard. “Why do you people forget to lock the outside gate? If some thief breaks into your house, then don’t come complaining to us,” he shouted angrily. We lived in an apartment block and each corridor had a gate. Since we were on the first floor, the Talibs had knocked on our door to ask us this. The Talib looked at my dad and said, “Okay. Lock the door and make sure this doesn’t happen again.” And they left. My dad went out to lock the outside gate. Ignoring us, he went back to his room and fell asleep. The three of us ran to the TV. We waited a couple of minutes just to make sure the Taliban had gone far enough, and then we turned it on. We watched the entire movie and early that morning returned the TV to its place before my dad woke up. I can never forget the fear and the happiness of that night. We were doing our favorite thing, but with so much fear in our hearts because during the Taliban, enjoying life, even little things, was a sin. I too was scared on reading that the Taliban knocked on your door. I was thinking, what are they going to do now? How are they going to hide the TV? So glad that you could watch the movie! I watched Dilwale Dulhaniya Le Jayenge when it came out (I was in school) in India. The name “Simran” (Actress Kajol’s character in the movie) became so popular at that time! Everybody was crazy about (and still are) Shah Rukh Khan and Kajol. My friends, my younger sister & I used to sit on our big swing and sing songs from this and other popular movies at that time! What an innocent time that was! Thank you for getting your story out here! For a moment I too went back in time! Stay safe and keep on writing! @KCHAVDA, your so right,the movie was so popular,and tell u something,i think watching movies at that time was very fun ahahah becouse you watched them once in a while and with so much awarness,and fear,and exitment in heart ahaha. we didnt hav a swing but we sure sang the songs in in all of the DOLL weddings specially the one LEGAYNGE LEYGAYNGE DIL WALE DULHANIA LEJAYENGE ahah.everytime these songs come on tv i feel like pulled back in those old times…its a different feeling. It’s a sweet story about the priorities of childhood, even under a repressive regime like the Taliban. Kids want the innocent pleasures that children want…It was only in the sick minds of the Taliban that made television, radio, movies, education, kites, pets, music, art and photographs somehow evil. I’m glad that you got to see your movie, listen to your radio and keep your television. It was a small way to rebel against those evil Talibs…. What I really like about your writing is the direct contrast of joy and fear. It makes your story dynamic and a pleasure to read! thank you all dear friends,your comments always make me so happy and proud. thanx alot. It’s hard to explain the unexplainable. It’s hard to comprehend the incomprehensible. Yet, this post describes a situation where what is rumored actually happens, or, at least, almost happens. When the author writes, “I guess it’s them,” my brother said. “The light of the TV probably. Or the sound.” I cringed; my jaw dropped to the floor, and immediately hoped that this wasn’t going to be the case. And, I suppose I started to understand something that was previously incomprehensible. What I can say to augment my reaction is simply that by describing one simple event, one family’s experience, can make the reality of the Taliban rule in Afghan all the more understandable and real to a reader who lives in another world. I will certainly think about the juxtaposition of experiencing both joy and fear at the same time for many days to come. Dear Rabia: First I want to start off bye saying I am sooooo so happy the Taliban did not find your TV. My heart skipped a beat just reading this so I can only imagine! I also want to thank you for writing about this thrilling close call with us even though it is dangerous to do it. Where would the world be with out the people who are brave enough to not let the Taliban control every aspect of their lives. I love to see that you find enjoyment in TV. Most people take things like TV, Internet, and communication for granted, I know I do. I know the Taliban says that things like watching TV is a sin but please don’t ever let them make you think that’s true. Creativity and enjoyment is vital and a beautiful thing for everyone to express. Your writing is an amazing way to express your self. Don’t ever stop doing what you love because that’s what makes us who we are. At the same way stay safe and keep that blanket over the TV.